I bought a shirt online and it’s great and I love it. However, it was waaaaaay too big. 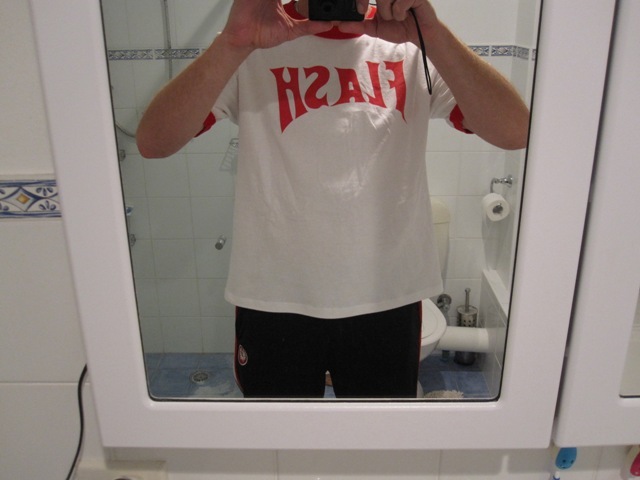 I put in through the wash and then in the dryer until it shrank, but it retained the length. To be able to wear it I needed to cut about 5 inches or so (about 12 cm) off the length. 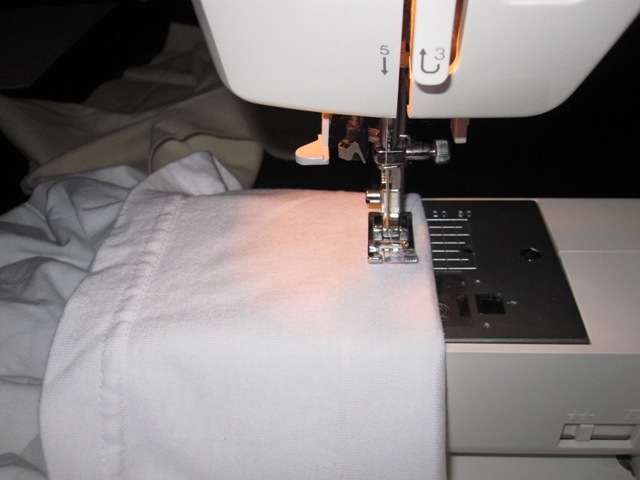 And of course, I needed to make it look neat so I had to sew a hem. I thought I’d take a few photos and put it on the blog because, hey, it’s still a project, right? First thing I did was work out how much to chop off. The problem with cutting stuff is that you can’t make it longer if you make a mistake. 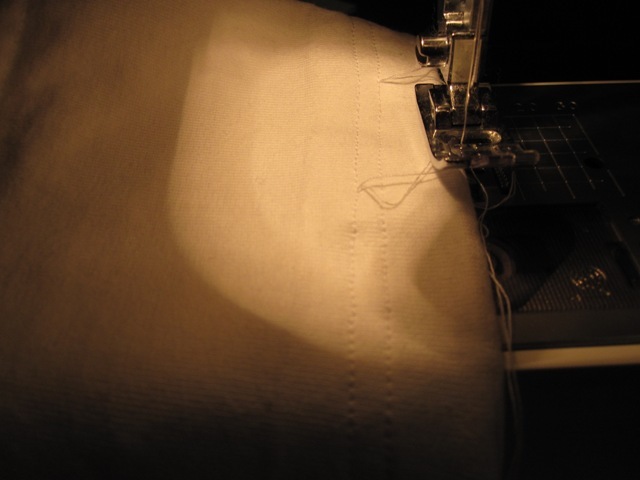 It’s important to make sure that the length is right before you start sewing or cutting – like they say, measure twice, cut once. To do this, I estimated the length, tried to get it as equal as possible all the way around and then pinned it up. 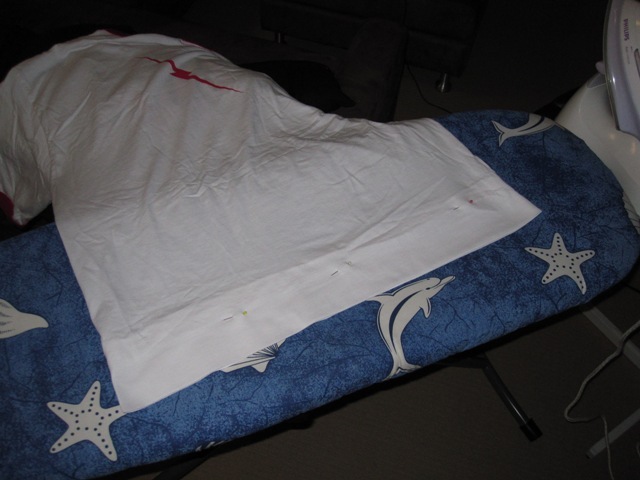 I then ironed the edge flat so that it would not only show how it will look, but also so it stayed in place to a degree. The next step is to check that it’s right. You can’t do this enough as it’s hard to change once it’s been finished. However (and I did this only once) if it’s not right, you can re-pin and re-iron to make sure it’s right. Right, so once the length is right and even, it’s time to hit the sewing machine. I decided to sew first and then cut because I thought it might be easier to fix mistakes that way. Luckily it all went smoothly. Anyway, since the shirt is pinned and ironed, the edge of where you’re sewing is pretty straight. I measured about the same distance as the original hem (pic below: on the left) and then used the grid on the sewing machine (pic below: metal plate just to the right of the needle) to make sure it stayed straight. 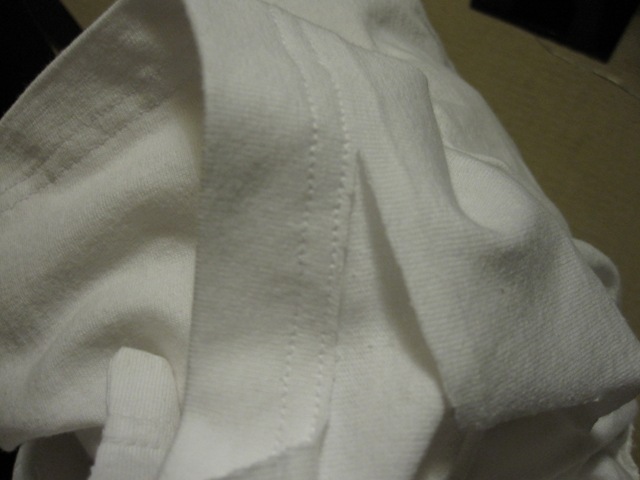 Using a straight stitch, I follow the shirt right around and made sure it was level by following the guide. Once I’d gone the whole way around the shirt with the first stitch, I then moved the shirt to the right the width of the foot of the needle and started the second line. I kept that one parallel by using the edge of the foot as a guide. Once you go right around with the second parallel stich, you’re done with the sewing bit – easy, huh? It should look something like below. So now that it’s sewn, it’s a good idea to try it on again – no pins this time 🙂 – just to make sure it’s even. Just tuck the extra bit up and you should see a pretty good indication of how it will look once it’s finished. If everything is good, it’s now time to do the final step – the cutting. 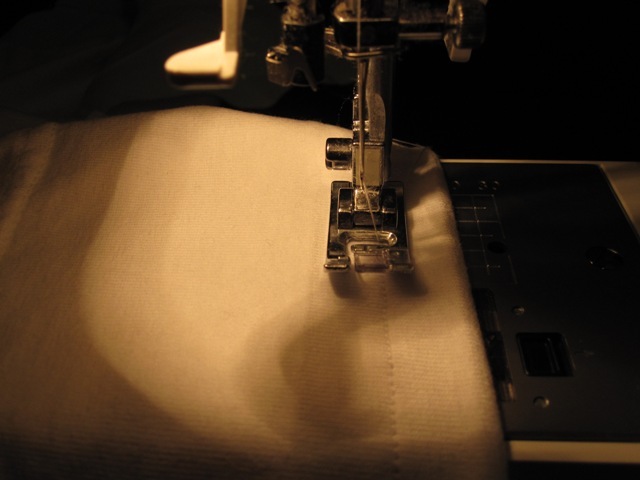 Now, you should turn the t-shirt inside out and then cut as close to the outside stitch as possible, but without risking that the stitch will come undone. 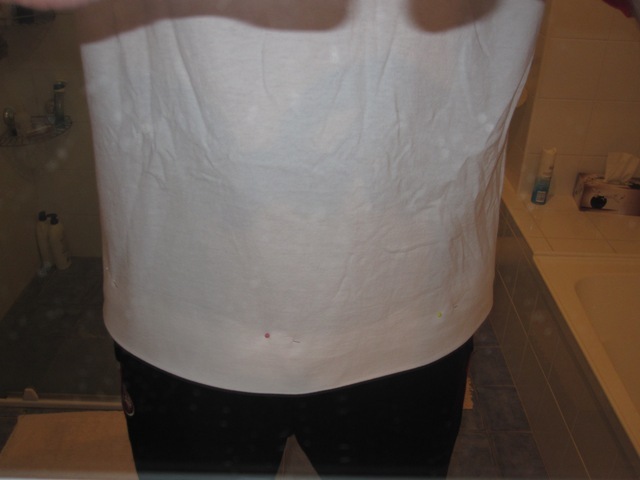 Just be really careful that you don’t catch up the other part of the shirt and put a hole in it! Once you’ve cut right around, it’s done! Now you’re ready to wear it, but if you don’t need it straight away, it’s probably not a bad idea to wash and iron it if you want. So the time has come. I have decided that I need to lose weight. So far, so good, though. 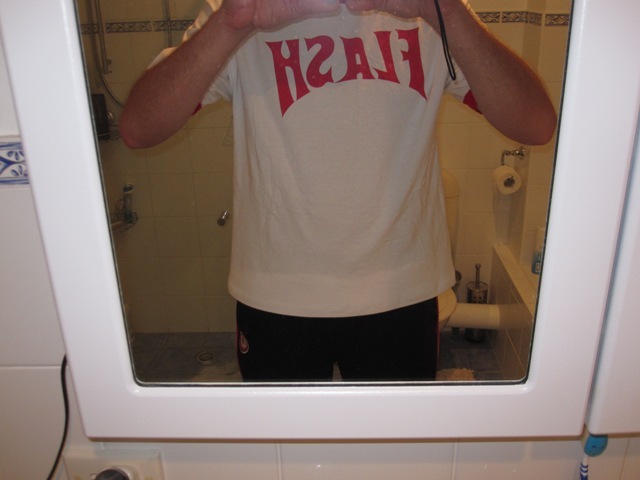 Since November 2010, I have lost about 7 and a half kilos. Pretty happy with that. But now it’s time to start getting a little more serious. Time to start actually exercising. The problem with exercise is that it isn’t very fun. So, I’m trying to find ways to be able to get some exercise that are fun and don’t cost any (or little) money. I’m thinking two things at the moment. Firstly, I’ve started doing push ups and sit ups. Cost = $0, energy spent = negligable, enjoyment = not much. However, it’s kind of tightening things up and hurting – so it must be good. My plan is pretty simple. I am crap as push ups and sit ups so I’ve decided to start relalistically. The first time (yesterday) I got up to 15. That’s it. 15 push ups and 15 sit ups. I really couldn’t do any more than that and was fatigued afterwards. However, I persevered and I made my 15. Today I did 16. Tomorrow, 17 and so on. Eventually I’ll get to 100 or whatever, but it will be slowly and only the same small increase each day. It’s going okay, but I’m hoping my body will respond quickly. But, I come from the school of overkill and can’t be bothered spending the time to find the exact spots where I should be applying Dynamat, so I just covered as much as I can. On the outer shell of the door, I have covered it at around 100% (there may be slight areas where the mat doesn’t join, but it will still give it full coverage) and on the inner shell of the door, I have sealed up all the service holes and applied to resonant prone areas. Previously, I have just Dynamatted around the speaker and behind it. This is quite often enough. But, I have to be honest and say that I have found a noticable difference in the way the speaker plays and for that I’m happy to have gone the extra mile. Then, because I like overkill, I have applied a new product that Dynamat puts out called a Dynazorb. It’s designed to specifically absorb the stray frequencies that bounce out of the back of the speaker. I don’t know if it’s really worth the money (around $40 each), but I have had reports from professional installers who have tested it and they say the difference is noticable. I believe them. Firstly, take a sharpie to the door and mark all of the holes that you need to keep open. This included the door handle holes, but mostly where the door trim plugs go in. Anything that screws in need to still be able to, and will be sealed anyway once filled, so you don’t need to cover those. I’ve marked mine with little x symbols. You won’t see them once the door trim is on, so it’s okay. The next step is pretty easy in that you just go through and cover each of the holes, cutting a larger piece than you need and sticking it over the hole. Then go through and tap on the bare areas and work out which ones are hollow sounding and whack some dynamat on there. Just cutting up small strips seems to do the trick. The only problem areas is where the door lock rods come through. You DON’T want the Dynamat to stick to these rods and make it impossible to open/close/lock your door. So, this is how I got around it and still had as much sealing as I could. Above is the hole with the rod sticking out of it. I’m going to make a kind of flap to seal it as much as possible. Firstly, cut a strip that goes just past where the rod goes into the door. Next we want to have the rest covered from the outside, but we don’t want the dynamat to stick to the rod. Work out where the rod moves and cut a second piece of Dynamat to be pressed against the back of the first, thereby creating a smooth area for the rod to move along. Then stick that pad onto the serivce hole and try to close up the sticky ends as much as possible while leaving a free channel for the rod to move along. And then here’s the finished product. And finally, mount the speaker and you’re all done. If you want MORE overkill, you can cover the door 100%, but the key thing is the service holes on this side. Okay, now that we have the spacer in there, the easy part is next – mounting the speaker. The first thing we need to do is rewire the speaker to the existing wires. As I said before, we’re going to rewire all the speakers to the amp once it’s installed, but for now we want to have functioning speakers in the door. Grab the speaker you took out earlier and reconnect the wiring. We need to make sure we are connecting the right wires so it’s important to make notes. When we do the full wiring, we’ll label the wires for future reference, but for now we just need to make sure the colours match up. Once you’ve connected the wiring, follow the wires from the door side of the speaker, through the connector and to the speaker. On the speaker, you’ll see the positive and negative symbols. Write down what you’ve discovered to ensure we get the right wires connecting. For this part you need some tools. Ideally, you’ll need wires cutters, a wire stripping tool, a soldering iron and some solder and some heat shrink. If you don’t want to do it properly, you can get out of it with a pair of pliers with a cutter on it and some electrical tape. Personally, I like to make sure it’s done right. Cut the wires on the door side of the connector. Strip those wires in preparation for joining them up. Strip the wires on the speaker that you’re connecting ready to join with the door side wires. In my tutorial, I’m actually using a separate piece of wire that I’m putting new connectors on to go to the speaker. Check from your notes that you have the positive wire connecting with the positive wire. Twist the two together, solder them and then cover with the heat shrink (remember to put the heat shrink on BEFORE you join the wires) – or just twist and tape if that’s how you’re doing it. On the other end, connect the positive wire to the positive terminal. For this I needed to make connectors – I’ve stripped the wire, attached the connector, soldered in place and covered with heatshrink. Do the same for the negative wires. Now that the speaker is connected to the door, put the speaker in place and attach with screws that come with the speaker. Ensure that the speaker is properly secured to avoid rattles. Later on we will put some closed cell foam around the speaker to help with sealing it, but for now just ensure it’s secured. Then repeat the same steps for the other door. Replace the door trim and enjoy the new sound. It will be better than the old speakers, but not as good as it will be once the wiring is done. Also note that I have replaced the speakers with coaxial speakers rather than splits. This means that the speaker has a tweeter built in rather than separate. I disconnected the stock tweeter so that it isn’t fighting the coax tweeter. Next step is making the spacers for the door speakers. Firstly, we want to use mdf. Mdf is a type of wood that is made by sticking sheets of recycled wood together. You can purchase it from the hardware shop in various sizes and thicknesses. For this one I have used some 18mm thick mdf that I had lying around. You should use mdf over chipboard (chipboard is made from the same material, but is chips of wood glued together and pressed) as chipboard swells with the smallest amount of moisture and crumbles easily. Athough not covered in this part of the tutorial yet, it’s an excellent idea to give the spacer a coat of paint to seal them in so that the wood isn’t affected by moisture. I will do this later in the project as time is a factor at the moment. Anyway, the frist step is to draw some circles on the mdf to prepare for cutting. There are a couple of ways to do this. One way is to make a template which you can test fits in the space and make sure the left and right are the same size. Another way is to measure the diameter (width of the circle) and find something around the same size and trace around it. That’s what I did. Either way, you need to make a circle around the same size as the outer ring of the plastic speaker mount that we removed earlier, and an inner ring the same size as the inner area of the mount. Ideally, when we cut the inner circle, the mount should sit inside it comfortably. Don’t worry too much about getting it exact, but err on the side of larger rather than smaller. You can always sand it back if you need to. Worse case scenario, you can cut another one. For cutting the spacer, you’ll need a drill with assorted drill bits, a hole drilling bit and a jig saw. All of these you can pick up pretty cheaply from Bunnings (or any hardware store) if you need to. Most people already have things like that, so either use your own or borrow one. Once the holes are drawn, you’ll need to get the jigsaw bit in there, so you’ll need to cut a hole in the middle big enough to start the jigsaw. Use the hole drilling bit for this and drill a hole somewhere in the middle. It doesn’t have to be accurate, it’s only to get the jigsaw blade in there. Now that you have the holes to start, it’s time to make the first jigsaw cut. Remember that you should make the iside cut first as it’s easier to hold the board, rather than if you cut the outside first and have to hold a small circle. You should always use the appropriate safety gear and where possible, use saw horses. I don’t have saw horses, so old milk crates suffice. You’ll notice from the off cut on the ground, start at the centre hole and work your way in a spiral motion until you hit the first drawn circle. then follow the circle around (don’t cut the jigsaw cord!) and keep going until you complete the circle. It’s best to do both at the same time so you end up with two large holes in your board. Just take a moment to check the size. The easiest way to do this is to sit the plastic mount inside the cut you’ve just made and check that it fits inside fairly snuggly. If it doesn’t, either make the cut again if it’s way out, or use some sandpaper to smooth it down to make it fit. Another good way to check (and you really should do this) is to see if the speaker fits in there. If it’s too small, the speaker won’t sit flush against the wood. If it’s too large, the holes for the screws to affix the speaker will be too close to the edge. Next, cut the second inside hole. Once they are both done, it’s time to cut the outside circle. We don’t need to drill a hole for this as you can just start from the edge of the board. Go around in the same motion as the inside circle. Once complete, you should have a spacer looking piece of wood as below. Then go through and make the second cut. You can check that the sizing is right by sitting the plastic mount on top and gauging the size. Once finished, you should have two spacers that are similar in size to the plastic mount. Now that we have the spacers, we need to be able to mount them to the door. We do this by drilling holes in it. You can use the original screws that you removed to take the plastic mount out, but they are too short, so we’ll need to countersink them. Get the first spacer and place the pastic mount inside it. Then use the screw holes as guides and mark where they are. It’s a good idea to write “TOP” at the top of the spacer so you know which way it sits up in the car. Once you’ve marked the where the holes should be, get the appropriate drill bit size (err on the side of smaller here if you aren’t sure) and drill the holes through. Next, we need to countersink the holes. This means that we drill a hole the same size as the head of the screw (maybe a tiny bit bigger) so that the screw can go further into the wood. I used a small sized hole drilling bit, but if you have a large drill bit it will work just as well. Not only does this mean that you can use the original screws and they won’t get in the way when we mount the speaker on top. After the countersink holes are drilled, it should look like the picture below. The final step is to attach it to the door with the original screws (put the “TOP” bit at the top) and make sure it fits. The next step is the actual speakers now. For this project I will be putting in the door speakers and also a sub woofer in the boot. I’ve decided to do the speakers first and to make sure they sound alright and work, I have decided to install the speakers with the existing wiring straight to the head unit. Then, after the amp is in place, we will run the speaker wire. The main advantage of this is that the owner of the car can still drive it, listen to music and not be hassled with wires sticking out everywhere. Firstly, let’s look at the speaker. Obviously, we need to take this one out to put the new one in, so the first step is to disconnect it. To do this, locate the clips on top of the speaker and pull them apart. It’s not too difficult as there is a little push in piece of plastic that will make it easy to remove. Once you’ve done that the other part of the clip will slide along the top and be free of the speaker mount. Once the clip is undone, remove the four OUTER screws which attach the speaker mount to the door. It’s easiest to remove the whole thing, rather than take the speaker out first. We won’t be using the mount or speaker again, so you can get rid of it as you see fit. However, before you do, it’s handy to keep one of the mounts for when we make the mdf baffles (more on that soon). Once removed, the door should look like this. Now, it’s not recommended that you just bolt the new speakers straight into the door. The reasons for this is that a) metal isn’t very flexible and therefore the speaker will rattle if you do that, b) the speaker is probably too small to fit the mounting screws and c) the back of the speaker (voice coil) will most likely hit the window when you wind it down. By putting a spacer against the door and then mounting the speaker on that, all of these issues are avoided. The next step is to make a wooden spacer (also called mount or baffle) to attach the speaker to the door. We’re now finally ready to start putting in the sound deadening. Firstly, a word about different products. There are two kinds of sound deadening – cheap and useless and expensive and effective. Many people chose the cheap option but it really doesn’t compare to the more expensive products. I would recommend to always go with Dynamat or Stinger sound deadening products. The reason they are expensive is because they work. Would you buy a Coles brand head unit or amp? So why skimp on the sound deadening which is just as important to good sound. Anyway, I chose to use Dynamat so that’s the product I’ll use for this tutorial. It’s readily available, not stupidly expensive, but very efficient. I have seen (well, heard) the difference in using Dynamat first hand in my own car, so I know it works well. It costs around $30 a sheet and it took me about 1 and 2/3 sheets to do one door on the Getz. However, that’s with full coverage. They recommend that anywhere between 30 – 60% coverage is fine, so if you are on a budget, you can put a little less in. I choose to do it properly. Dynamat works in three ways. Firstly, the foil creates a sonic barrier which transforms noise into silent energy. With the movement of the car, the energy normally resonates within the metal panels. The Dynamat stops this. Secondly, the tar-like sticky part that adheses to the metal adds weight to the panel and therefore also stops it from rattling. And lastly, the denseness of the tar stuff absorbs the random sound waves that come the wrong way out of the speaker so that you only hear the good stuff. They say using 15 to 30% coverage of Dynamat will decrease the noise in your car by 3db, and add 3db to the sound pressure level of your speakers. While I don’t know how accurate that is and it would depend on the car, speakers, etc, it does help. Anyway, let’s get prepared for putting the Dynamat in. Make sure you have everything handy – ruler, sharpie and stanley knife. Of course, you also need to Dynamat. I purchased a box of it ($250 or so, cheaper than buying it by the sheet). Next, we want the Dynamat to stick at well as it can, so it’s a good idea to clean off any residue, dirt, dust, etc. It’s a good idea to use grease and tar remover. This time I tried “De-solve it” a product made from oranges or something and it worked quite well. You’ll also need a rag to wipe on and a rag to make sure there’s no slippery bits. Go around and give the metal a good rub with the rag (spray the cleaner on the rag, not the door) and then go around and clean off any residue with another clean rag. Don’t spend ages on this, the cleaner the surface the better it is to stick stuff on. I just gave it a quick rub down and it came up all shiny. Now that it’s clean, it’s best to cut the Dynamat into strips. You have to get into the outer shell through the service holes, so it’s hard to do the whole sheet. Also I found there was a support bar in the way… To cut the sheet to the right size strips, stick a ruler inside the door cavity and get a rough measurement. It doesn’t have to be exact as the Dynamat is easy to mould around stuff. The best method is the cut and try method. To start off, measure up the section you want to put a strip on. Then measure that out on the sheet with the ruler, marking it with the sharpie. No one will see the inside of the door, so don’t worry about marker everywhere. Cut the strip with a stanley knife (lie the sheet down on concrete like in the pic and then run the knife along it) and be careful not to cut yourself. Now, while I think of it, if you’re doing this during the day and it’s not raining, chuck the sheets of Dynamat out in the sun. They heat up a little and it’s easier to mould them. Just don’t put them in the direct sun so they get so hot you can’t handle them. Okay, now that we have a strip, place it into the cavity in the spot you want it to go. Leave the backing on the strip because you’re just making sure it fits before we stick it on. If you’re happy that it does fit, peel the backing off it and then carefully put it back in place. You can smooth it onto the surface with a roller that’s sold by Dynamat, or you can just use your hands. For my money, I found my hands to be cheaper. Just make sure it’s as smooth as you can make it so it sticks well. Now, put the trim back on by going in reverse of the above, and then do the other door. Then have a beer, pat yourself on the back and wait for the next installment of my tutorial.